This idea of co-owning a property with others is an interesting proposition and, without a doubt, it's an arrangement more people are exploring given the high prices of real estate. The idea that a group of individuals could collectively purchase a multi-unit dwelling holds the potential to be a viable option in places where property values have grown at a rate that far outpaces incomes, and where land scarcity and availability of low-rise traditional houses have become serious barriers against homeownership. If a co-ownership model could be adapted to our existing housing stock without too much red tape, building code requirements, and financing obstacles, not only would homeownership be more accessible and affordable, but it could provide many of the same social and community values that accompany traditional homeownership - just in a non-traditional way. In addition to the possibility of significantly more housing options, there would also be pragmatic upsides. With shrinking household sizes, an aging population, high property operating expenses, and a whole lot of traditional housing stock that is larger than necessary for today's busy urban lives, it would be amazing if there were an economical easy-to-implement mechanism which allowed residences to be divided into individually-titled suites. For example a recent article by Global News suggests that as many as 9 out of 10 Seniors would like to age in place. Wouldn't it be amazing if a Senior could divide her property into another suite(s) which could be sold separately, thereby creating an opportunity to extract capital for herself while creating an additional unit of market housing? Unfortunately right now it doesn't exist, but if it did it would create more co-housing opportunities. Interestingly, the trend of co-housing is on the up, though it doesn't involve co-ownership. It's with the introduction of a new app - Nesterly - which allows Seniors who own 'too much house' and millennials without accommodations to pair up as roommates for a mutually beneficial living arrangement. The millennial gets affordable rental accommodation while the senior gets social interaction and support on a day-to-day basis. After all, who wouldn't want to spend their twilight years in the neighbourhood they've long put down roots? Moreover, this idea of 'co-housing for care' isn't just for seniors; any current homeowner could benefit from this form of downsizing, which creates income, help achieve other financial goals, and opens the door to additional support at home. I am a fan of co-ownership. 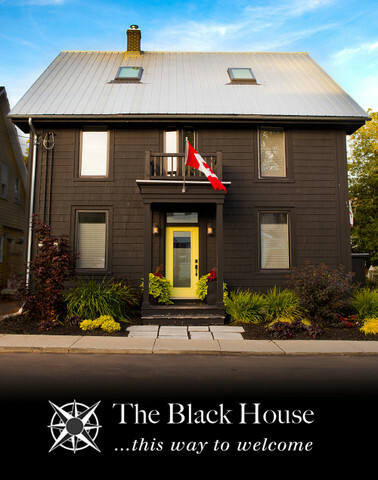 In fact, I co-own The Black House - a legal triplex we transformed in Charlottetown, PEI - with Urbaneer team member James Ormston who is also one of my besties of 30+ years (here's the Urbaneer blog on its reinvention called The Tales From Upper Hillsborough). Ten years ago James and I bought the place both because he works in PEI each Summer (this is his 20th year working in the Charlottetown Festival), and as a get-away throughout the year. It's both a home and an income property, with the other two furnished rental suites helping to offset our retrofit expenses, which were substantial given the mold and failing building components. We purchased it with the aim of staying with greater frequency in retirement, where we'll each have a suite with the third covering operating expenses. We jointly own the property with both of us on the title and the mortgage. And we never plan to sell it. However, in full transparency neither of us would be willing to co-own the dwelling with others we didn't trust implicitly, unless we held individual title to our own spaces and could register mortgages independent of any other owner without liability. The co-ownership framework where one can register a mortgage on a space they occupy on title currently does exist - albeit it's somewhat rare. In Toronto you can find it in the form of older former rental apartment buildings which were converted into individually owned suites much like a condominium but with a different legal ownership structure and financing model. This type of co-ownership requires larger down payments and unit mortgages often have slightly higher interest rates than more conventional housing. Although they increase in value at a slower rate than condominiums and freehold properties, they're also more affordable. Here's my must-read post exploring in detail what co-ownership is and how it distinguishes itself from other forms of home ownership in this post: What’s The Difference Between Condominiums And Co-Ownership? You are possibly already familiar with collective ownership of a shared space, like with the amenities in a condominium building. (Here's a good read: “Five Points to Ponder Before Buying a Condominium”). In a condominium purchase, you buy your unit outright and get a deed of ownership, but you are also purchasing a portion of the common areas, which are shared with other owners of the same condominium corporation. These common areas are maintained and upgraded by collective funds outlined in the legal documents, which all owners have and contribute to. You pay your own mortgage, operating costs if individually metered, and property taxes, and aren’t impacted if other owners don’t pay theirs. In most cases you are eligible for conventional mortgage financing, along with CMHC insurance (depending on your financials). To adopt the co-ownership model already existing for converted former apartment buildings in Toronto and apply it to the conversion of a freehold house, it may require meeting the requirements of the city to be legally zoned and conform to building code. However, one could create a more informal co-ownership arrangement that does not conform to building code nor allow for individual mortgages. In that instance each Buyer would purchase a percentage of the deed to the building (based on the size of their unit) and have their name listed on the title of ownership, alongside other owners. Along with this percentage of ownership might come the distinction of the right to live in a specific space of the property and the right to use shared spaces, through a contract stipulating who occupies spaces collectively and privately, how operational, maintenance, repair and upgrade expenses are allocated (in a co-ownership former apartment building and most condominiums it's based on the square footage of the building apportioned by personal space). To be a legal co-ownership corporation one would have to have their house converted from a freehold dwelling into a co-ownership complex (even if it's two units), in order for each owner to get independent financing from most lending institutions that distinguishes each individuals portion of mortgage debt and their obligations in paying it. If you were unable to convert the property into a legal co-ownership model, you could informally create a contract between all the owners under one shared mortgage; but the majority of banks will demand all owners each hold the full obligation of the full mortgage debt. You'd also have to agree to how long you'd collectively own the property before title and mortgage financing could be changed (say five or ten years to secure tenure)‎. But it's important to note that even if both parties agree to certain conditions around payment (i.e. a joint account will be set up for mortgage payments, several partial payments may compile the whole, etc. etc. ), there are legal and financial consequences if things go awry (which I explain further below) because, from a lender's perspective - this is considered joint debt. Is Co-Ownership A Cost Effective Approach? It is possible a house can be converted to a condo - or co-ownership - as multi-units but it would be with significant expense. The legal costs would run about $40,000 (regardless of the number of units) plus the dwelling would have to be retrofitted to meet building and fire codes. Separating the two units (especially if one is on top of the other) to meet both codes would come with substantial work and expense, and don’t forget that there is also the question of logistics and aesthetics around the design and layout of the two emerging units (especially if there are more than one vested parties trying to steer the outcome). From a cost standpoint alone, a condo or co-ownership conversion of a freehold dwelling would probably be similar in cost - and if that were the case I'd recommend converting to a condo status as it's a more familiar form of ownership and mortgage interest rates are lower for condos than co-ownerships in most instances - but let’s consider some of the challenges that could emerge. While co-ownership can offer an attractive avenue for homeownership that can mutually benefit all parties involved, there exists the potential for a number of challenges, mostly centering on financial and legal risk. If the property is not a legal conversion a mortgage which is registered against the title of the property cannot be separated, to either specific owners or to a specific portion of the dwelling. In other words, all owners, regardless of their equity ownership position, are responsible for whatever mortgage sum is collectively taken out against the property. Even though ownership is partial, financial responsibility is total. In a nutshell, if your co-owners default on their mortgage payments for their portion, you are responsible for the sum. You would also be responsible for the home’s total property taxes in the same way. When you apply for financing, all owner’s financial circumstances (both income, credit rating and existing debt) will be considered and assessed collectively by the lender. Not only can this impact your ability to qualify for the mortgage at all, it can also impact what kind of interest rate you’d be eligible for. If your co-owner has poor credit or falls short in some other criteria, you may very well have to pay a higher mortgage rate to compensate. Typically, co-owners of a home are required to put down a more substantial down payment, as co-ownership models actually comprise such a small part of the ownership population. This also can make it challenging to obtain traditional financing and/or CMHC insurance. In the event that your co-owners were to experience financial duress and defaulted on making payments, you'd be responsible for making good on the mortgage or otherwise risk jeopardizing your own security of tenure and credit rating. This is one of the biggest challenges with a less formal co-ownership arrangement. Be sure to consider your investment time horizon. Are you likely to want to sell your portion of the home long before your co-owners? How will that figure into potential return on investment? Not too long ago, an article in The Globe And Mail called 'Co-ownership On The Rise As Buyers Look To Enter Expensive Housing Markets' mentions "Meridian Credit Union Ltd., a financial organization that operates in Ontario, even has a mortgage option specifically tailored to co-owning. The company has always offered creative mortgages, but they only started branding it as a co-owning mortgage in 2017 when they started seeing increased demand for it." Interesting to read this option exists and may be worth exploring! Also, it's important to note that if a co-owner wishes to purchase an undivided interest in cash, that is possible (and they can avoid the financing challenges with the home ownership model). This is a good route if you’ve got a homeowner looking to downsize their home (and associated responsibility) and sell a portion to another co-owner. In this situation, the new co-owner would be registered on title as a tenant in Common and the property would not need to be converted into a condominium, as would generally be required. While this does provide an avenue to sidestep potential hurdles with financing, there are inherent, more practical challenges that could emerge. It is very challenging to for an existing homeowner to relinquish control over their home. While they may be able to downsize their home physically, but it is hard to detach themselves mentally and emotionally from past ownership. For that reason, co-ownership works much better when co-owners are moving into a home that is new to everyone. This creates equality and is more likely to produce a harmonious living arrangement, where co-owners share responsibility and input to the running of the household on more even ground. This approach is gaining traction in Toronto. For instance, Solterra Co-housing Ltd facilities a renovation or the construction of a single residential dwelling unit to accommodate people looking to reap the full benefits of co-ownership by starting out from “scratch” with a residence that is new to all parties involved. Their homes require no zoning changes, which is a big plus. There are a number of other particulars and scenarios to consider, beyond finances. If you are sharing common areas in addition to your percentage of the home, how is that space to be split/used? How will you handle maintenance and repairs? Does your personality mesh with other co-owners? How will collective agreements (or disagreements) be handled? This type of ownership goes beyond being “neighbourly”. Will that work for you? These challenges in and of themselves are not meant to deter the idea of co-ownership, but they do underscore the importance of due diligence and relying on the support and guidance of trained professionals to help you understand the implications of the contract and living arrangements that go along with co-ownership. Although affordability continues to be a challenge in Toronto and the dream of homeownership still burning brightly, even with rising prices (here's my recent post: “Why Does Homeownership Remain A Priority For Canadians, Despite The High Costs?”.) I see this as a viable alternative for city-building, though it would require a concerted effort on the part of city policy makers and lenders. Homeowners too, would need to become proactively knowledgeable about the implications in order for all parties to benefit from this model. Here are some interesting stores on the rise of co-ownership in the face of eroding affordability: “Soaring Toronto Housing Sparks Interest In Co-owning”, “Inside The Complicated World Of Home Co-ownership” and “Co-ownership Deals Offer Special Sets Of Challenges”. Are you a homeowner thinking about downsizing? Maybe you are a hopeful first time homebuyer tyring to gain access in this pricey market? Read some of my other posts on my Toronto real estate site called Urbaneer.com that you may find useful. Dear Urbaneer: How Do You Help Buyers Make The Right Real Estate Purchase? Thank you for reading our Homewatch series, where we share our experience and insight on anything and everything related to being a homeowner! *Like what you've read? Did you know we were recently listed as one of The Top 25 Toronto Real Estate Agents To Follow On Twitter! and The Top 50 Blogs On Toronto? Consider signing up in the box below to receive our FREE monthly e-newsletter on housing, culture and design including our love for unique urban homes and other Toronto real estate! *Love Canadian Housing? Check out Steve's Student Mentorship site called Houseporn.ca which focuses on architecture, landscape, design, product and real estate in Canada!